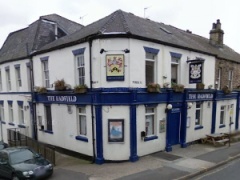 The Hadfield, Sheffield, S10 1ED. The Hadfield pub review, map and rating. Looking for a Hotel near The Hadfield? One to avoid. Drinks prices are cheap but it's either empty or full of people wanting to sell you drugs whilst listening to bass music. New management have ruined what used to be a thriving local. The Hadfield is an excellent place to have a nice refreshing beer... the staff there are excellent and i would recommend that if you are in the area.. you have a drink 5 star rating from me !!! The Hadfield is under NEW MANAGEMENT as of June 2012!!! We have just taken management of the Hadfield and after listening to the community's voices, we have decided to cater for EVERYONE in the community's voices. Come In and See the improvements we've made! Large Community Pub with a warm and friendly atmosphere. Pool table, Music and Fruit machine available. Themed Nights/Live DJ/Events/Sky Sports/Cafe - All COMING SOON!! !